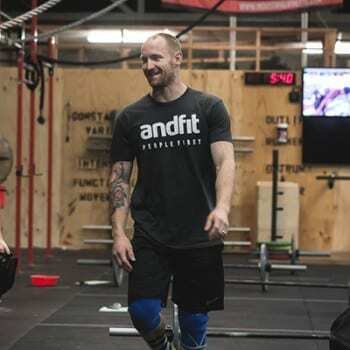 We are the owners and coaches of a CrossFit affiliate in Auckland, New Zealand called Andfit Crossfit. We’re worked hard in the last three years to grow a community of 150 members from all walks of life; from students to doctors, athletes, mums and dads and even grandmas. Our passion is to look after our people and to provide a fitness program that is beneficial, enjoyable, scalable and applicable long term for these people. Sure, we get excited about our top athletes but our passion is with the everyday member that looks to us for guidance on their health and fitness. The Projects programming has the exact same goal. We focus on people. This is the reason we do what we do. We focus on the everyday athlete. We believe being an athlete is a mindset. As an Affiliate owner, I understand the many roles that other affiliate owners carry. You’re the coach, the cleaner, the marketer, the members services person, the business man or women, the staff developer and the gym programmer. I know that by handing the programming to Projects, its going to make your life easier instantly! My passion lies in gymnastics and conditioning. I love nothing more than to see the everyday person become more capable and competent with the gymnastics movement through my programming and coaching. There is nothing I want more than to see people improve their health and fitness. My day consists of making people better and I can’t ask for a more rewarding job. I’ve been lucky to be apart of many success stories in our CrossFit community. I am focused on making sure my programming is for everybody, from the grandmother with 3 knee operations to the elite athlete that dreams of competing. We have been given the best tools to work with and putting a plan together for athletes to see them excel is what I love doing. We have seen amazing results with our programming and our general community at Andfit CrossFit has benefited from that. We’re available to take your queries and questions. Projects is best-practice programming for your affiliated gym. We provide monthly scheduling for your daily WOD's and extra workouts and training for competitive athletes.